Dhoni who after getting off to a flying start to CSK’s title defense is having a chilled-out Sunday. The 37-year-old who loves being around his daughter is heard asking her ‘How Are You?’ in several Indian languages such as Tamil, Punjabi, Gujarati and Punjabi. 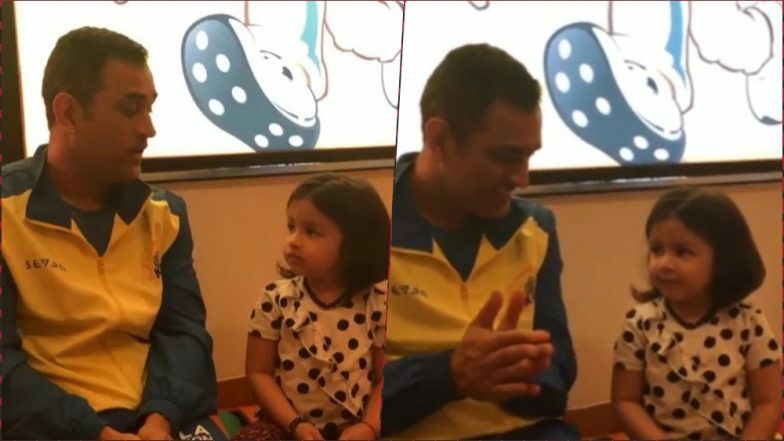 Dhoni also greets Ziva in Arabic, saying, “Inshallah” to which the cute little superstar quickly retorts, “Mashallah.” These two are so, so adorable in this video. We just cannot get over how sweetly Ziva says “Thike Ba” to his father who asks her in Bhojpuri “Kaisan Ba? (How are you?). Dhoni’s daughter who despite being just four is one of the most popular celebrity kids in the country. Videos of her singing several devotional songs or hanging out with her star cricketer father or posing for the cutest selfie with mom, Sakshi, everything goes viral on the social media. With VIVO IPL 2019 lasting till May 12, fans will get a chance to see more of Ziva and MS Dhoni’s cute camaraderie. As for Dhoni, he would like to fulfil his duties as a skipper and father to the best of his capabilities. In their opening game played on March 23, Chennai Super Kings thrashed Virat Kohli-led Royal Challengers Bangalore (RCB) by seven wickets at MA Chidambaram Stadium, Chennai. CSK will be next playing Delhi Capitals (DC) on March 26 at Feroz Shah Kotla in Delhi.